The Steve Biko Foundation, in partnership with the Durban University of Technology (DUT) and the UMTAPO Centre, hosted a FrankTalk dialogue under the theme: “Inequality & Poverty in Post-Apartheid South Africa: What Should Be Done?”, at the Steve Biko Campus, Art Gallery, on Thursday, 11 April 2019. The moderated dialogue between three individuals who are academics, activists and thought-leaders; looked at what should be done to address and reduce poverty and inequality and give South Africa a more human face. As 2019 marks the sixth democratic general elections in South Africa, the Steve Biko Foundation, a non-profit organisation, is facilitating a number of dialogues in different communities around the country in the lead up to the upcoming elections, aimed at reflecting on some of the critical challenges facing South Africa since 1994. The aim of the Steve Biko Foundation is to also promote the values that Steve Biko lived and died for, restoring people to their true humanity. UMTAPO, a partner for this event, engages in youth and women’s leadership training programmes, literacy and popular education, and information dissemination through publications and public fora for critical discourse. The FrankTalk dialogue closely examined South Africa’s economic and political trajectory since 1994, looking at what should be done to address the scourge of poverty and inequality, and the way forward. In attendance at the event were DUT’s (Vice – Chancellor and Principal), Professor Thandwa Mthembu, Professor Sibusiso Moyo (Deputy Vice – Chancellor: Research, Innovation and Engagement), Arun Naicker (UMTAPO Centre), Thando Sipuye (Steve Biko Foundation), DUT staff, students, UKZN representatives, MUT representatives, UNIZULU representatives, UMtapo representatives, Steve Biko Foundation representatives and other external stakeholders. The panellists included DUT’s Dr David Mohale (Director – Special Projects: Office of the Vice – Chancellor), UKZN’s Professor Oliver Mtapuri (Associate Professor, School of the Built Environment and Development Studies), Abahlali baseMjondolo’s Nhlanhla Mtshali (Provincial Secretary), moderated by UKZN’s Chantal Christopher, a PHD candidate, Discipline: Occupational Therapy. Programme Director Arun Naicker from the UMTAPO Centre welcomed all the guests to the event, who stressed that the dialogue was about finding solutions within ourselves. Also welcoming everyone to DUT was Prof Moyo, who added that the dialogue had come at a right time, especially when South Africa faced many challenges such as unemployment, poverty and gender based violence, and that the question was what can be done now to shape the future. Sipuye from the Steve Biko Foundation gave an overview and purpose of the Steve Biko Foundation, and its aim of looking at the critical issues that are affecting communities in South Africa in the lead up to the general elections. “There are a lot of issues that are affecting people in various communities. For us, we have identified inequality as a key factor that affects all communities. Twenty-five years into democracy, South Africa is the most unequal nation in the world with gross levels of violence, poverty and unemployment. We are hoping that our panellists will assist us in finding solutions, we want to hear what communities are thinking and what should be done to address inequality and poverty in South Africa,” he stressed. The issue of poverty was delved into by panellist Mtshali, who emphasized that poverty was created by the capitalist system which was impossible to change. Prof Mtapuri agreed with Mtshali and said that the issue the panellists were discussing traces back to colonisation, that same system and process during apartheid. “To address these issues we got to look at policy measures that are taken, things have to change,” he stressed. Dr Mohale added that the wealth in South Africa did not benefit the majority. “The absence of strategic public-private relationship explains the national failure to build processing capacity of our raw minerals, which would create jobs. The continued cheap exportation of raw minerals, extracted from the belly of the earth by exploited mine workers confirms the timidity of the state and preponderance of the business,” he said. Speaking more on the issue of the impact of poverty and inequality, especially at DUT, was Dr Mohale. He added that DUT mainly attracts students from rural and poor backgrounds, who would not survive if it was not for NSFAS funding. “We run the food programme through our Alumni Office to help those without funding at all. The Office of the Vice – Chancellor helps those who are academically deserving with fees if they are not funded at all. DUT is also one of the few universities that participate in the Siyaphumelela Project. We use empirical data in order to understand a variety of factors that influence students’ success and develop appropriate strategies,” he said. Other issues that were tackled were on dealing with the stunted economy, the contentious land question, as well as the upcoming elections. In a round – up, Naicker concluded the programme saying that we (South Africans) do live in a capitalist system that moulds us to think in a certain way. “We spoke about what system, I think in South Africa and the world over, we need a new system and everyone should take it as their responsibility to add to that new system,” she said. 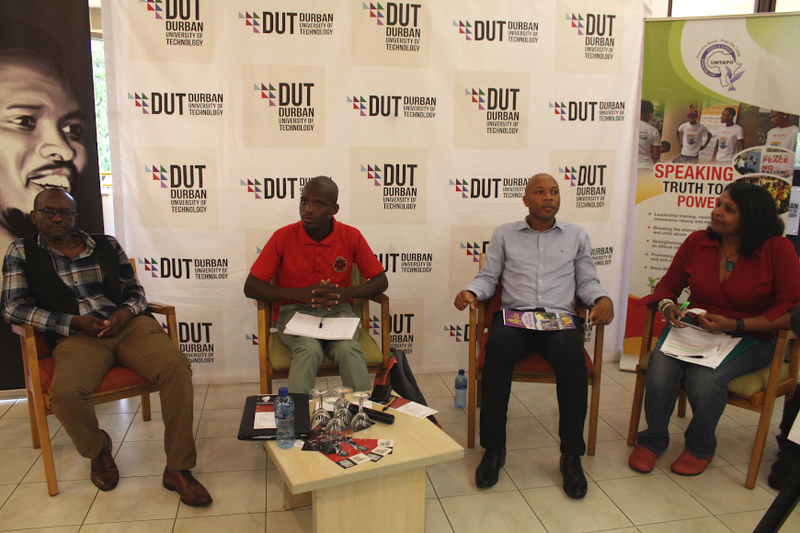 Pictured: The panellists of FrankTalk Dialogue at DUT.